Text by Neha Gupta. Photographs by Ankur Chaturvedi. If you have ever envisaged Santa’s humming workshop, that is exactly how Indiana Jones at Trident Hotel in Mumbai looked on the momentous afternoon that we visited. 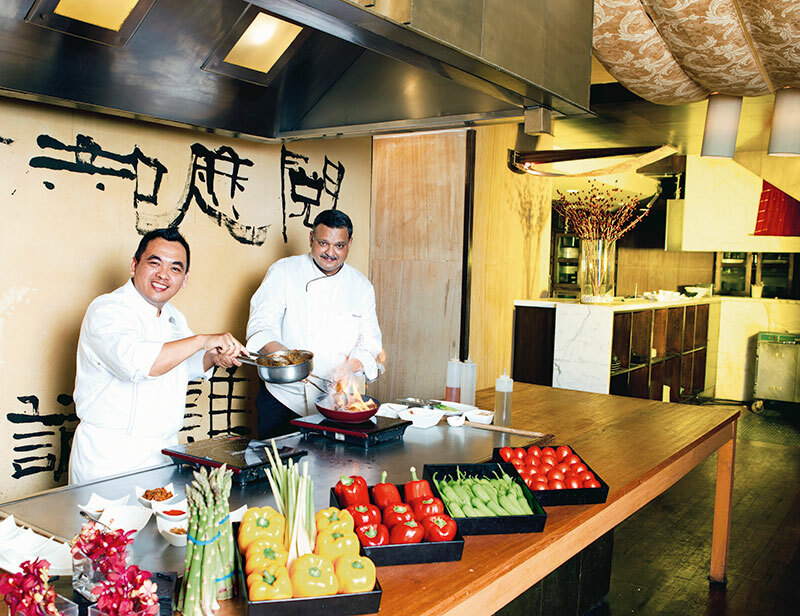 Cooking stations were being set for two chefs – Executive Chef Joy Bhattacharya and Malay Chef Kamarudin Bin Dali, for an evening of a cook-off of sorts. The many commis (assistants) were scurrying about, preparing the stage for the arrival of the much-revered Chef Joy. Someone asked for the spices tray, another whizzed by with mini baskets of chopped vegetables. In the midst of this hustle and bustle, Chef Dali, who had flown down from Mandarin Oriental, Kuala Lumpur, made an early appearance to watch the behind-the-scenes with amusement. When quizzed about his plan for the evening’s menu, he shrugs, “I’m just here to promote Malaysian food. It’s up to the chef (Chef Joy) to decide on the menu.” Just then Chef Joy rushes in from a briefing to his troop on the special carte du jour for the much industrious evening of the Malay-special festival. Everything had to be perfect – from taste to arrangements on plates. “You taste with your eyes first,” was the chef’s rationale as he nodded to one of the commis who held up a raw steak for his approval. From the age of 10, Chef Joy was introduced to kitchen utensils and raw ingredients. “My mother used to come back from office and cook for us. First, I used to just watch her make dal, which looked very simple. Later, before she reached home, I already used to have something on the fire so she could come and supervise it,” he narrated. It was no wonder we could easily spot his familiar comfort in the kitchen from a mile away. All the while he was in conversation with us, he maintained eye-contact, didn’t look into his pan of mushrooms and very naturally, minutes later, turned it over onto his plate, deeming them done. He then smiled at our wide-eyed expression, “If you make cooking your lifeline, there is a point when your food starts talking to you. You’ve seen chefs; they’ve put something on the stove, are probably 10 feet away doing something else, but they will always know when to say, ‘please turn it.’” Unless the foods get naughty, we don’t suppose Chef Joy encounters overdone or burnt dishes. This statement had Chef Dali nodding in strong approval. He nudged Chef Joy to peek into his pan before he flipped the beefy pieces into the air and caught them back in the pan. A boyish duel had begun. Chef Joy, not wanting to be outdone, put his spare dish on fire with a chuckle. They kept craning their necks in the other’s direction to breathe in a whiff of the cuisine in the making. About an hour later, a spray of redolence from the beef, garlic, shallots, mushrooms and spices tickled our sense of smell and instigated the salivary glands. But that was not the end of the cook-mania. Chef Joy placed a plate on the counter and with his finger, prudently chalked out a floor plan for the tenderloin and mushrooms. Next, he carefully dug a fork into the steak’s heart and cautiously shook it loose on the plate’s pre-designated spot. Just then Chef Dali twisted his hotplate’s knobs to a close. Taking in the aromas of his rendang, he exclaimed, jubilant, “Wow!” The rice that was set aside to take shape of the bowl was thumped on the dish. Unfortunately, it collapsed. We expected disappointment. We got a quick-skilled-fix. He used a spoon to scoop it up into a neat pile, finished with a leaf on the tip. When we wondered if we needed chopsticks to grab onto those rice grains, he waved his hands in the air and held up five fingers – “You eat with these.” Just like Indians! And we devoured every morsel of it with bare hands, just as much aswe devoured Chef Joy’s fillet with a fork and knife. Ingredients: Tenderloin eye fillet 4 steaks, 200 gms each; Mushroom ragout, 200 gms; Asparagus, blanched, 8 nos; Cognac, 60 ml; Tenderloin jus, 60 ml; Onion, medium, 1 number; Garlic salt, pinch; Corn starch, 1 tsp; Refined oil, for frying; Salt and pepper, to taste; Olive oil, 1 tbs; Paris mushrooms, sliced, 150 gms; King oyster mushroom, sliced, 60 gms; Cepes, sliced, 40 gms; Chopped shallots, 2 tbs; Fresh thyme leaves, 1 tsp; Chopped chive, 2 tsp. Method: Season the steaks with salt and pepper and grill on all sides to sear the meat. Place the steaks on the slow side of the grill and allow to cook until medium done, basting occasionally and turning sides. Keep in a warm place to rest. Slice the onion into thin roundels, season with garlic salt and allow to rest for a few minutes. Squeeze dry and mix with corn starch. Fry until crisp in medium hot oil. Drain on absorbent paper towel. For assembly, toss the asparagus in olive oil, season and place on the plate along with the mushroom ragout. In a hot pan, pour olive oil, place the tenderloin steak, pour cognac and light the fumes. This imparts a smoky flavour to the steak. 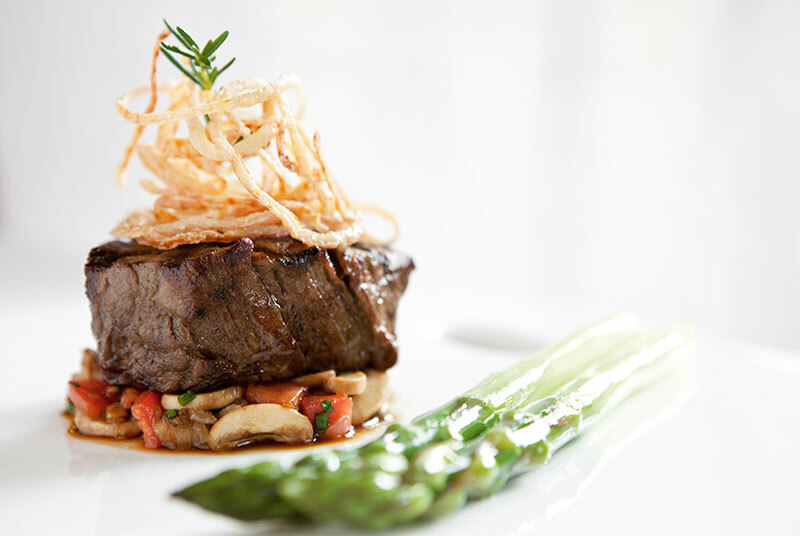 Place the tenderloin on top of the mushroom ragout, garnish with crisp frizzled onion. Serve hot ladled with the jus. For the Mushroom ragout: Heat olive oil, sauté the shallots until transparent, add fresh thyme and the mushrooms, cook for a few minutes. Finish with tomatoes, chopped chives and seasoning. Ingredients: Oil, 200 ml; Shallots, 100 gms; Garlic, 40 gms; Ginger, 20 gms; Galangal, 10 gms; Lemongrass, 40 gms; Fennel seed, 5 gms; Cumin seed, 5 gms; Chilli paste, 150 gms; Brown sugar, 80 gms; Coconut cream, 80 ml; Grated coconut, 1500 gms; Tenderloin, 500 gms; Turmeric leaf, 20 gms; Lime leaf, 20 gms; Salt, to taste. Method: Heat the oil in a pot, sauté all the ingredients till golden brown. Add beef, chilli paste and cook till the meat is tender. Make sure the temperature is set to medium for this preparation. Add grated coconut, brown sugar, coconut cream, turmeric and lime leaf (chopped) and salt. Once the raw flavour of all the ingredients subsides, remove from fire. 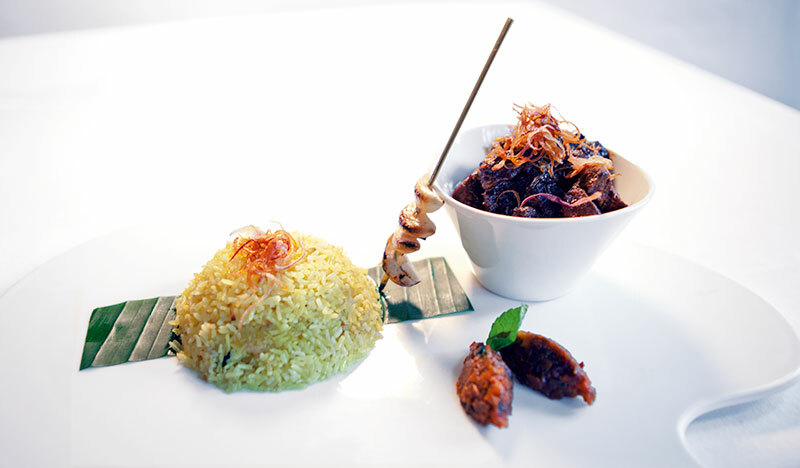 Ready to serve with yellow rice and pickle fruit.